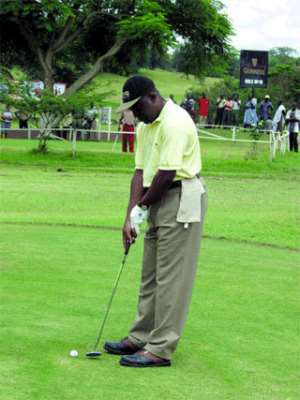 Accra, May 18, GNA--The 37th annual Asantehene Open Golf Championship tees off at the Kumasi Golf Course from Saturday, May 22 to Sunday, May 23. A source from the Kumasi Golf Club said in Accra on Tuesday that about 200 amateur and professional golfers throughout the country are expected to participate in the competition christened, "The Asantehene Gold Cup". He said the event, being sponsored by Ghana Breweries Limited, also forms part of activities marking the celebration of the Adae Kese and the fifth anniversary of Asantehene's enstoolment. Leonard MacCaulley, Kofi Aggrey, Dan Dennis and Samuel Adetola, all from the Achimota Golf Club are expected to meet stiff opposition from other golfers like John Cobbina, Alex Fiagomey and Felix Owusu-Adjapong. The professionals will engage in a hectic three-day 72- Hole event starting from Friday, May 21.